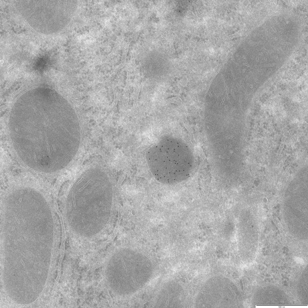 ER exit site in 60 nm-thin cryosection of Hepg2 cells, labeled for COPII (primary antibody against sec23 was obtained by ABR) and detected with Fab-goat-anti-rabbit, conjugated to ultra-small gold, silver enhanced for 30 minutes (from Aurion). 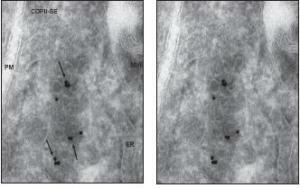 The arrows point to labeled COPII-coats on vesicular and tubular membranes, which are located close to the ER. The information of a thin section is not sufficient to conclude how the membranes are related to each other- if they are still connected to the ER, or if they are free. Therefore we performed 3D electron tomography on 400nm thick cryosections, which were labeled similar for COPII. (see next picture). 2 views of a model of a COPII-labeled ER-exit site, resolved from 400nm thick cryo-sections of Hepg2 cells, labeled like described for the ultrathin section before. Note that the labeling for COPII is assessable throughout the section. Courtesy of: Dagmar Zeuschner, Judith Klumperman (Department of Cell Biology, UMC Utrecht, The Netherlands) and Willie Geerts, Abraham Koster (Molecular Cell Biology, Utrecht University, The Netherlands). ImmunoGold Silver Staining of laminin in paraffin embedded rat intestine using rabbit polyclonal anti laminin antibody and GAR IgG Ultra Small. Silver enhancement with Aurion R-Gent SE-LM for 25 minutes. Section is counterstained with nuclear fast red. Immunogold labeling of Middle East Respiratory Syndrome-coronavirus (MERS-CoV). 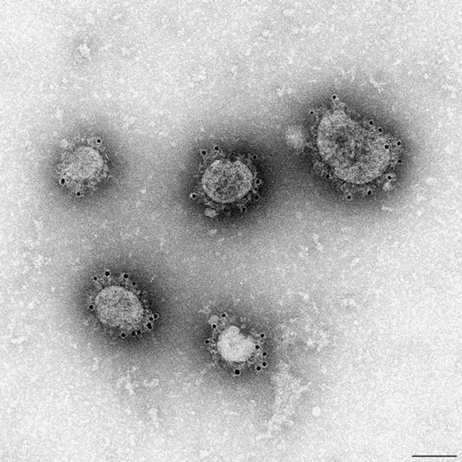 MERS virus is grown in VERO cells via a grid cell culture technique. Primary antibody is a camel anti MERS serum which reacts with the glycoprotein spikes of the virus. Detection with Protein A 10nm. After incubation with the gold reagent specimens are fixed in glutaraldehyde and negative stained with Nano-W.
Immunogold labeling of peroxisomes in Tokuyasu sections of perfusion fixed rat liver tissue using 2% paraformaldehyde + 0.1% glutaraldehyde. Catalase was detected using a 1/500 dilution of rabbit anti catalase (Rockland) and Goat anti Rabbit 10nm gold conjugate diluted 1/20.